Like many other well-known YouTube gaming personalities, Gary ‘RageElixir’ Yong found his audience by uploading Minecraft videos. Yong, who recently snagged a Venom-themed gaming room redesign sponsorship from computer hardware company Micro-Star International, was 16 when he put out his first videos — mostly Minecraft tutorials teaching viewers everything from basic farming to creating their own armor. Six years later, Yong has amassed more than 2.3 million subscribers — and those millions of subscribers know they can still expect Minecraft content from him on the regular. 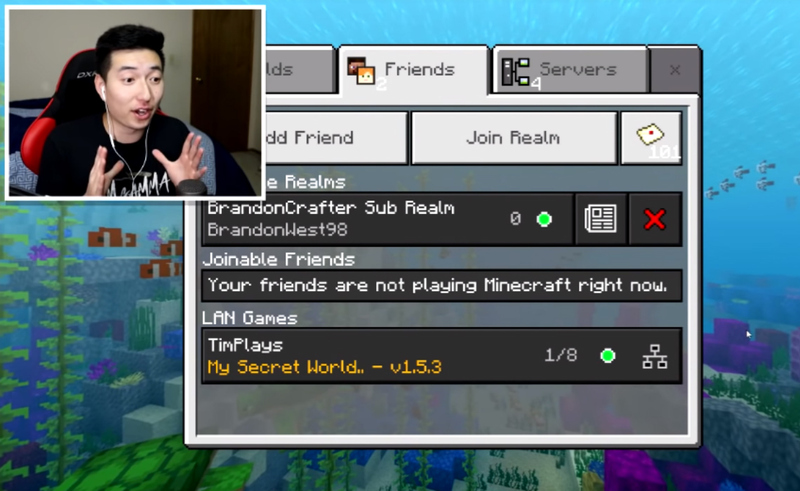 While many other YouTube gaming veterans have moved on to newer games, Yong has stayed steady on the Minecraft course (though he does occasionally dip his toes in other games, like the massively popular Fortnite and Roblox), holding to a daily posting schedule and keeping his per-day view counts in the hundreds of thousands. Now, with his views regularly topping 20 million per month and his time at college coming to an end, he’s looking forward to his future as a full-time YouTube creator who doesn’t have to carve up his schedule for school. Check out our chat with Yong about what gaming YouTubers inspired him to become a creator, how he built his audience, and where he plans to go from here. Tubefilter: Tell us about your background! When did you start gaming? What draws you to Minecraft in particular? Gary Yong: I am Chinese-American and was born in Seattle, Washington. I remember in preschool I was first introduced to video games when I visited my best friend’s house, and we would play on the original PlayStation. Ever since then, I have always been fascinated by video games. I knew about Minecraft when it first came out — when I was in eighth grade — and I believe it was in its early alpha stages, and was still playable within an internet browser. TF: What made you decide to join YouTube? Why did you decide to start your YouTube career making tutorials and why did you decide to expand into making Let’s Plays? GY: YouTube has always been a big part of my life. Growing up, around the age of eight or nine, I discovered YouTube watching content creators such as NigaHiga, JustKiddingFilms, KevJumba, and Wong Fu Productions. They were very big role models in my life growing up, and provided endless amounts of entertainment. Watching them made me want to do what they did when I grew up. As my aspirations for becoming a doctor began to fade away, the more I wanted to become an online personality. I knew I wanted to put my life out there on the internet, but I was not so sure what type of content I wanted to post. In middle school, I would post dancing and art videos, as I was interested in those things at the time, but later I moved on to making videos related to gaming, specifically mobile gaming, since my family never provided any sort of game consoles growing up. I used my first ever iPod Touch to its fullest extent by making videos playing a mobile FPS game called Modern Combat 3. I enjoyed making friends in the mobile gaming community and making story time commentary videos sharing my life through YouTube. I later found interest in Minecraft again because I had heard that it was finally coming out on iOS! I really enjoyed the game, so I wanted to share my experience as well as teach those that did not understand the game as much as I did on YouTube, so I transitioned my content to Minecraft. TF: When did you get your first check for online video revenue? How much was it? GY: I remember doing YouTube for four or five years without getting paid a single penny because I had not been partnered by a network. I believe it was during my sophomore year of high school when I first got the opportunity to be paid for what I did on YouTube. I still remember how much I earned for my first check on YouTube: a whopping $75. It was the most money I had ever earned in my life, and I was ecstatic! Being able to do what I loved and getting paid for it was the most fascinating thing I had ever heard of at the time. TF: When did you get your first sponsorship offer? Did they reach out to you? What was that experience like? GY: I believe my first sponsorship offer was to play a mobile game for $15. I was very excited at the time. It was a very simple process, where I just played the game and made a video about it. TF: Can you also talk about your Ironside Computers sponsorship? How did that come about? GY: Five years ago, I was using a very old laptop and I needed something to be able to create better quality content on. So I reached out to multiple computer companies, and luckily, Ironside Computers was kind enough to give me a chance to become one of their sponsored creators. TF: When was that Semaphore Moment for you—the first time you realized you were a professional YouTube creator? Do you consider YouTube your career? GY: I had been a huge fan of the FaZe members at the time, and they were around the age that I was. They had all begun to pursue YouTube as a professional career right out of high school instead of attending college because they believed that this was their passion and wanted to do nothing other than YouTube. I had been inspired by their stories, and seeing that although my channel size was not at the caliber of theirs, I knew that one day, if I put all my time and effort into my craft, it would become a reality. Short answer is: The moment I realized I was a professional YouTube creator was around the time I was graduating high school. My channel was around 100,000 subscribers, and I was one of the only people in my niche to be able to reach a milestone of that level. I think my love for YouTube as a consumer and viewer who watched hundreds of thousands of hours of its content motivated me to become a content creator myself and pursue this as a professional career. I never thought that this could become a full-time job for me. Although I am still attending my final year of university, I do consider YouTube my career and full-time job. TF: Fortnite fervor has sort of consumed the YouTube gaming sphere. You play Fortnite and have uploaded a few Fortnite vids, but you’ve primarily stuck to making Minecraft videos. Can you chat a little about that? GY: My fans don’t enjoy anything but Minecraft, so it is very hard to transition out of playing other games. However, I plan to play more games in the future, and hopefully become more of a variety gaming channel. I’d like to become more of a brand than someone that just creates Minecraft content. TF: Do you have a production crew or editor? What’s your upload schedule like? GY: I do production and editing all on my own. I try to upload every single day, but it’s tough, especially during the school year. TF: What’s next for you and your channel? What are you building toward? GY: I want to become more of a brand and personality than just a Minecraft content creator. I love creating videos, and I want to be able to do this for as long as I can. YouTube has changed my life, and I will never take that for granted. This journey has taught me to appreciate all the little things, and to take advantage of every opportunity you get, because you may never have that chance again.